Welcome back to another Throw Back Thursday edition! Please tell me you giggled when you saw this photo. While looking through my old photos and deciding which one I should pick, this baby jumped right out of the computer at me. This is myself, my mother, and my little sister around May of 2002. My mom took us to Eureka Springs, Arkansas for my Senior trip. I had just stolen mom’s Creative Memories stash started scrapbooking when we took this trip and when we walked past the store front for this photographer I begged my mom to let us take a picture. I am so glad we did. My mom is my hero. She has done so much for me. She doesn’t agree with every decision I make, but she still supports me no matter what. I know she has sacrificed so much in her own life so my sister and I could have what we needed and wanted growing up. Thank you Mom for everything you’ve done. I love you. 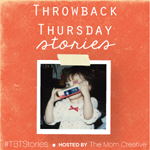 Thank you to Jessica at The Mom Creative for hosting this #TBTStories linky party. Welcome to a new series here on SweetNScrappy called #TBTStories. A huge thank you to Jessica at The Mom Creative for hosting this amazing opportunity to share not only our older photos, but the important stories behind them. I am going to begin this series with a picture of myself and my little sister Jennifer. I was in the 5th grade here and that would put her in the 1st. (Please notice the rocking spiral perm…yes I thought I was all that and a bag of chips!) What you can’t obviously see in this picture is, this is the last year our family would be what society considers “whole”. My mom and dad got divorced shortly after Christmas that year. My little sister and I would become latch key kids while our mother worked 2-3 jobs to provide for all of our needs & wants. This also meant that I became sort of like a surrogate mother to my mini me. Jennifer and I have always fought like cats and dogs. To this day if we are together more than 3 days in a row you can expect some discourse after that 😉 but there was something about me being in charge that brought out this protective mama bear instinct in me. I could pick on her, but you better watch your tail end if you think I am going to let anyone else! I thank God for this time in my life because it helped me to become more responsible and see that divorce might not have been God’s plan for us, but he did have a plan B. That plan B has led my sister and I on the most unbelievable ride imaginable that I wouldn’t trade for the world. Jennifer has made me so proud. I am so happy for her choice in a husband, I no longer have to worry about making sure she is taken care of, Shelby will make sure of that. I am proud of her hard work and commitment to get her RN degree finished this May. I am proud because I feel like she is truly my own. I love you sister. Thanks for always being there for me and being my forever best friend.